﻿ Vice President of European Parliament: "It is Time to Put the Chinese Communist Regime on Trial for Genocide"
Vice President of European Parliament: "It is Time to Put the Chinese Communist Regime on Trial for Genocide"
The Vice-President of the European Parliament, Mr Edward McMillan-Scott, organised "The Silent Genocide" press conference at London's Foreign Press Association recently. He invited experts on China, scholars, as well as Falun Gong practitioners who personally suffered persecution, to expose the genocidal crimes of the Chinese Communist regime's organ harvesting from living Falun Gong practitioners. At the press conference, Mr Scott described his fact-finding visit to Beijing three years ago. At the end of his speech, he said: "My investigation, my contacts and my experience all make me feel that the Chinese Communist totalitarian regime has persecuted Falun Gong, this innocent and kind group, for ten years. I think it is time to put the Chinese Communist regime on trial for genocide. I firmly believe that what we are doing today should be carried out in every city of the world and every day until justice is served." On the tenth anniversary of the "April 25" peaceful appeal by ten thousand Falun Gong practitioners in Beijing, this press conference formed part of the European Parliament's campaign demanding that the Chinese Communist regime stop its persecution of Falun Gong. 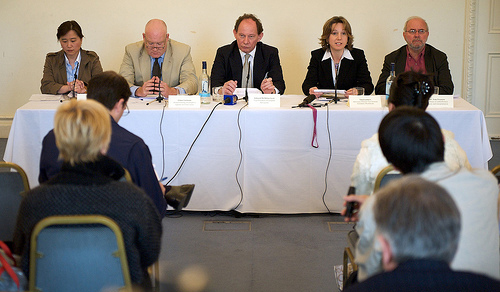 Invited speakers at the conference included China expert and the author of book Losing the New China Mr Ethan Gutmann, renowned British cardiothoracic surgeon Professor Tom Treasure, Ms Tina Lambert from Christian Solidarity Worldwide and Falun Gong practitioner Annie Yang, who was illegally imprisoned and tortured by the Chinese Communist regime. She said: "People should stop this evil persecution." Vice-President of the European Parliament, Mr Edward McMillan-Scott, pointed out that the crime committed by the Chinese Communist regime in its ten year long persecution of Falun Gong is genocide. He said: "The atrocity of the Chinese Communist regime's organ harvesting from living Falun Gong practitioners has been exposed, in great detail, in the joint investigative report in 2006 by the former Canadian Foreign Secretary of State (Asia-Pacific region) David Kilgour and human rights lawyer David Matas. At present, this report has been translated and published in sixteen languages." In his opening speech, Mr Scott described his fact-finding visit to Beijing three years ago: "I am here today because I visited China three years ago. As the longest serving member of the European Parliament, I also visited China many times before that. At that time, I was preparing a report on human rights, freedom and democracy for the European Commission. I held a meeting with two former prisoners of conscience, Niu Jinping and Cao Dong. Both of them are Falun Gong practitioners. The two were both imprisoned before and were released. Niu Jinping came to me for help regarding his wife. His wife Zhang Lianying was imprisoned in the Beijing Women's Forced Labour Camp then. He said his wife was severely tortured and lost her hearing. A few months later she was finally released and wrote me a letter, describing in detail how she suffered over fifty different torture methods in the labour camp." Mr Scott continued: "Regrettably, in the further repressive movement before the Beijing Olympics, Niu Jinping and his wife were imprisoned again. Cao Dong and his wife are both Falun Gong practitioners and they are also both imprisoned. Cao Dong is imprisoned in Northern China where people involved in the 1989 Tiananmen student movement were detained. Cao Dong told me that one evening his best friend disappeared from the prison cell. When he saw his friend again, it was in the prison morgue. There were lots of holes in his body. Many of his organs had been taken." Mr Scott indicated that the purpose of this press conference is to raise people's awareness about China's human rights situation. He said: "Everyone I was in contact with in Beijing was later arrested and imprisoned. Some of them were even tortured. Some have been imprisoned until now. In view of this, we will hold a series of activities in the European Parliament or other places." He said: "I already wrote a letter to the General Secretary of the United Nations, urging the UN to carry out a careful investigation into the persecution suffered by Falun Gong in China. According to the definition of genocide in Article 2 of the UN's Human Rights Treaty, the ongoing persecution of Falun Gong in China has already qualified as genocide. This is also the reason we organised today's press conference." China expert and the author of book Losing the New China, Mr Ethan Gutmann, has been carrying out research about the persecution of Falun Gong for several years. He is currently preparing to write a special book about the persecution of Falun Gong based on his own research. He reported his findings at the press conference. He said: "The Western media underestimated from the very beginning the scale of the "war" the Chinese Communist regime initiated against Falun Gong. The Western media shared the regime's initial thinking: this war would be over in a very short time and Falun Gong would "disappear". But on the contrary, Falun Gong has not disappeared. However thousands of Falun Gong practitioners have died as a result of the persecution in the war by the Chinese Communist regime." Mr Gutmann continued: "Two years ago I started investigating and researching this conflict between the Chinese Communist regime and Falun Gong. I interviewed hundreds of people. About half of them were Falun Gong practitioners who personally experienced imprisonment in the jails and labour camps of the Chinese Communist regime. What puzzled me is that about thirty per cent of Falun Gong practitioners described to me their experiences of going through unconventional health checks. All the tests were unusually concentrated on the kidney, the liver, eyes and sometimes the heart. These examinations were usually unnecessary and moreover quite expensive. Comparing these facts with tens of thousands organ transplant cases carried out in recent years in China whose sources could not be explained and the high organ prices in the international black markets, then the reasonable explanation is that the Chinese Communist regime has been systematically trading organs from Falun Gong practitioners for exorbitant profits through black markets. "How many Falun Gong practitioners have been harvested for their organs? China's 610 Office estimated that there were 70 million Falun Gong practitioners. According to the Laogai Research Foundation, the Chinese Communist regime's labour camp system has imprisoned about four million people, about half of them Falun Gong practitioners. According to my estimation, at least 87,000 Falun Gong practitioners have had their organs harvested by the Chinese Communist regime in these years. "When the atrocity of the organ harvesting from the living people was exposed in 2006, regrettably, the Western media were unwilling to touch this topic. It is obvious that they don't want to think about this issue. But the facts are there. Anybody may go and carry out an investigation. But it is puzzling that nobody wants to do this. I am startled to discover that our investigation is the first in the world. All Falun Gong practitioners I interviewed, particularly those Falun Gong practitioners applying for refugee status in Thailand – the great majority of them have never been interviewed. Without doubt, this is a great shame to the Western world." Renowned British cardiothoracic surgeon Professor Tom Treasure described, at the press conference, his views on the organ harvesting from living people occurring in China. He said: "I read the report by Kilgour and Matas. The descriptions in the report are truly horrific. But as a surgeon who knows well the international organ transplantation situation, after reading the report, I find that many aspects are similar to what I have learned, such as the large number of organ transplants. It is very easy for patients to reserve their organs in China. Moreover the number of organ transplants and the donor sources that can possibly be produced in normal conditions in China can't be matched at all. Thus their report can be said to describe a true and horrific fact. "What impressed me the most is that the number of organ transplants is far larger than reasonable. Moreover, they can satisfy patients' needs and deliver organs in a timely fashion. Lastly aside from the numbers, there are also other facts that are very convincing and can't be neglected. "I will talk about one now. A few years ago, when I was the president of the European Heart Surgeons Association, I often met colleagues from the US, Asia and Europe at international conferences. The one topic we talked about was surgery demonstration; that is, whether it is ethical to show the real surgery in the classroom. An American surgeon told me: 'Once I was invited to carry out a lung surgery demonstration in China.' To do surgery demonstration in the conference requires fixing the surgery time in advance. However it is not possible to fix organ transplantation time because the availability of the organ source is not certain. So he replied: 'It is impossible for you to do that.' But the Chinese side said: 'We definitely can.'" Professor Treasure concluded: "To me, this is a solid fact that can finally prove the case, very very convincing. Ms Tina Lambert from the Christian Solidarity Worldwide introduced to the press conference the Chinese Communist regime's persecution of religion and human rights. She said: "The Chinese Communist regime has been unscrupulously carrying out various persecutions against beliefs that it considers not under its control, from financial fines, harassment, tearing down property, imprisonment and torture. But it has not succeeded." She cited an example: "For example the regime has pursued a relentless and brutal persecution against Falun Gong for ten years. Still, Falun Gong does not submit to its suppression. This makes the regime very afraid." She concluded: "It is essential that the international community holds this kind of public hearing and exerts continuous pressure on the Chinese Communist regime. I thank all the people involved in organising this conference. In China, communism has no way to provide solutions for the social crisis. Not only have religious beliefs not been exterminated in China, they have been strengthened. The Chinese Communist regime's policy of suppression will never succeed."